Several years ago I had dinner with a co-worker at the Middle Eastern restaurant down the street from where we worked. The only food I had previously eaten there were the felafal sandwiches I ordered for pickup and ate in the break room. They were good, but nothing special. The most significant thing about them was that they piled the felafal, cucumbers, tomatoes, and tahini sauce on top of the pita instead of stuffing it inside. So I wasn't really sure what to expect when we went inside and sat down at one of the tables in the small dining room. When I opened the menu, there was lots more than felafal, hummus, and tabbouleh on the menu. I ordered lamb chops served over couscous with apricots and pistachios. It came garnished with pomegranate seeds, and was one of the more memorable meals I've eaten in Chicago. But what I really remembered was the carrot soup I had for my appetizer. It was rich and creamy and had an amazing blend of spices that all served to enhance the velvety carrot taste and texture without overtaking it. I tried many versions of carrot soup since, trying to recapture that amazing dish, but none even came close. So I decided to try to make my own. I found a recipe on a newsgroup online that looked promising. It called for carrots, ginger, cardamom, cumin, and coriander, all of which seemed to be heading in the right direction. I got the ingredients and got down to business. My first attempt was not very successful. The recipe called for two tablespoons of chopped ginger, one tablespoon of cumin, and one tablespoon of either coriander or cardamom. It seemed like a lot of spice in proportion to the 4 cups of carrots and broth, but my usual method when trying something new is to follow the recipe as written so I have a baseline for comparison, then make adjustments from there. It was too much spice and too much heat from the ginger. 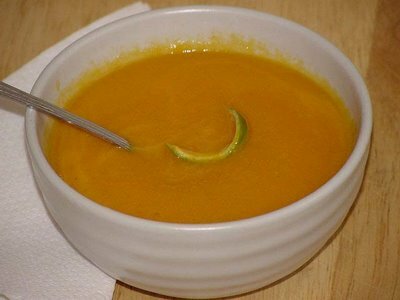 The only recognizable aspect of the carrot was the color of the soup. But I persevered over the years, going lighter and lighter on the spices each time. I finally found a version that bore enough of a resemblance to the original version to satisfy me, and I've been making it that way for the past few years. I had some carrots on hand so I decided to make carrot soup for dinner tonight. The weather has been unseasonably cold this week and a nice hot soup seemed like just the thing. So I par-boiled the carrots to prep them, ran some errands, and came back to make the soup. Perhaps it's because I've been playing with some new spices lately, but I thought I'd try a different blend of spices this time. I had bought some fennel seeds for the Chicken Chennai, and I started to wonder what ground fennel would do to my soup. And instead of cardamom, I added coriander this time. When I tasted it toward the end, it seemed a little sour (not usually one of my favorate tastes), but I couldn't decide what it needed. I was tempted to add sugar, but it didn't seem like that would be the right balance for what the soup needed. I sliced up an orange and tested a little orange juice in it--it seemed like that might be a good combination. It wasn't. I was right in my original thought that sugar wasn't the right thing to add. It didn't need sweet, but it definitely needed something. So I cut up a lime and tested that. Bingo. It took the slightly sour backtaste and brought it right out to the fore. And while I'm not usually a big fan of sour, it was just what this dish needed. I'm very pleased with it, and think I've found my final verson. processor. Return to heat and bring back to a simmer. no, i'm not part of this company, just believe in ginger. I will be having nightmares about those ginger people. The recipes look really good, though.